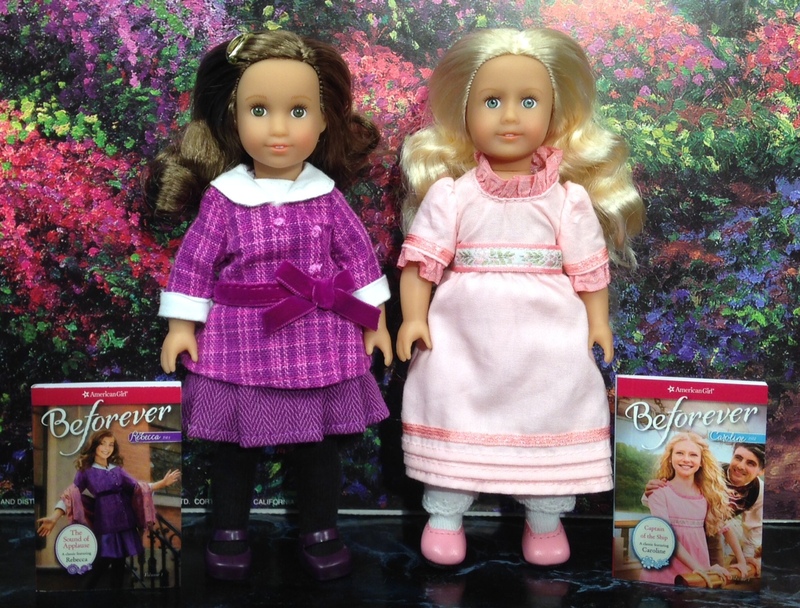 American Girl recently updated their historical line changing the name to Beforever. I got two of the new mini dolls. 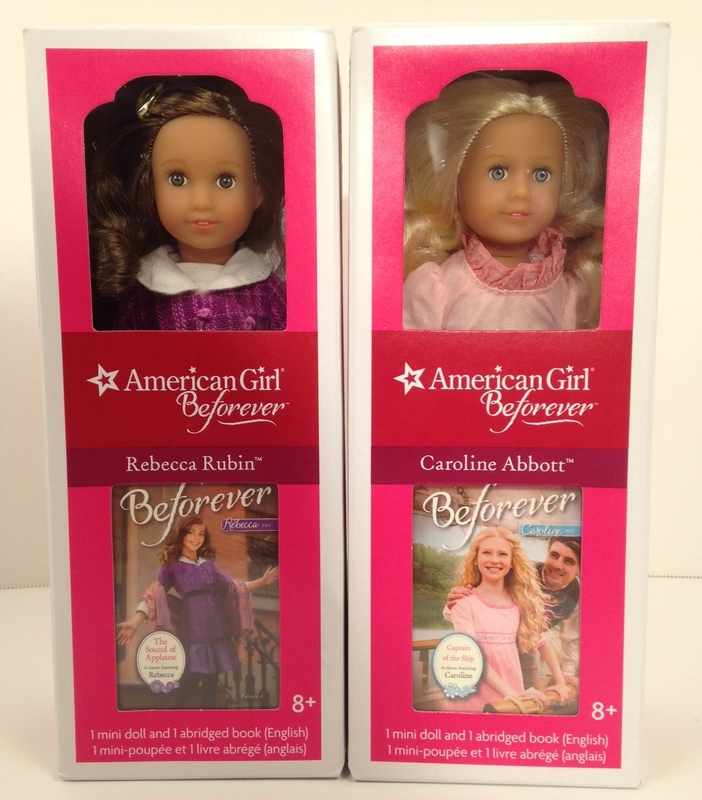 Rebecca is on the left and Caroline is on the right. 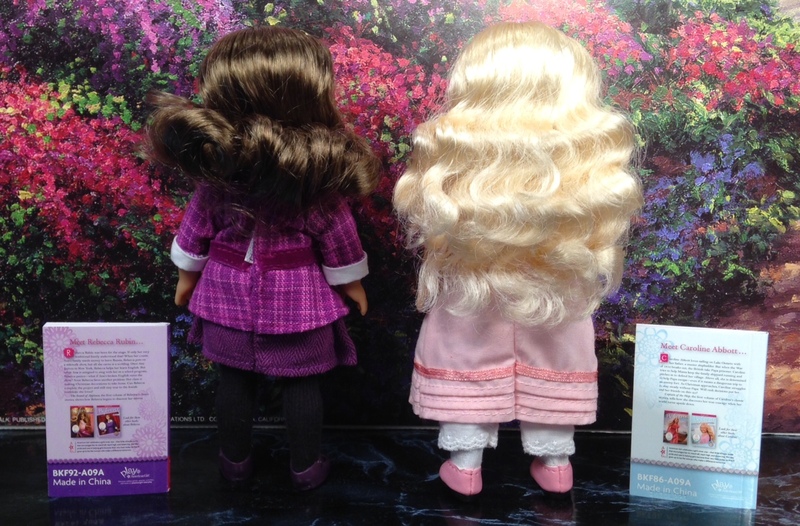 The new Mini dolls no longer have a cloth body. They have very nice quality hair. Rebecca’s got a little squashed in her box. Rebecca’s dress is one piece although the full size american girl doll version of this is a two piece outfit. Rebecca is wearing the purple dress from my free dresses section with a top, shoulder straps, and circle skirt. Caroline is wearing a pink dress from the Laura set with a top, straight skirt, and wrap around collar. This evening one of my American Girl Dolls wanted a new dress so I made her one:) My Barbie Fashionista is more than a little surprised that her dress was just “borrowed” by an American girl doll! You can see how to make this dress here. 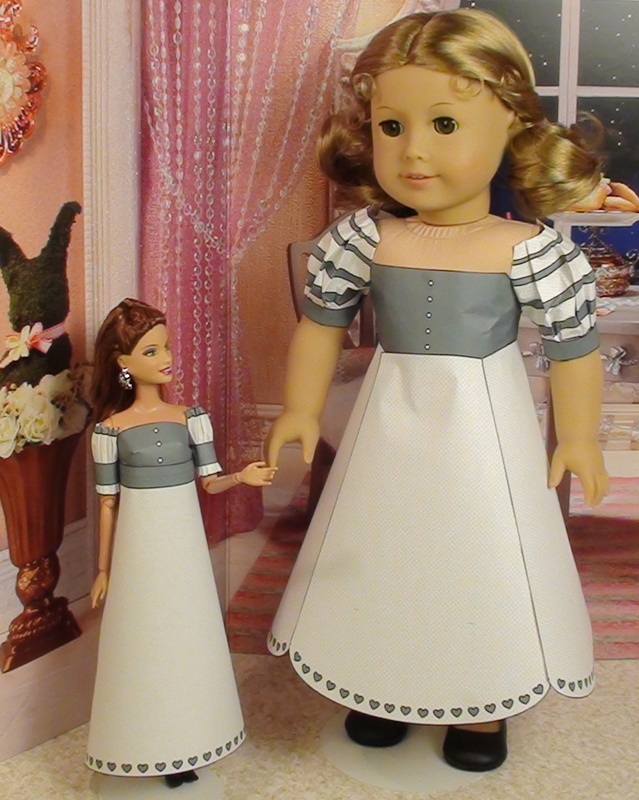 Earlier I’d made this dress for another of my American Girl Dolls. However, I like the new dress layout better. It is also easier to make. 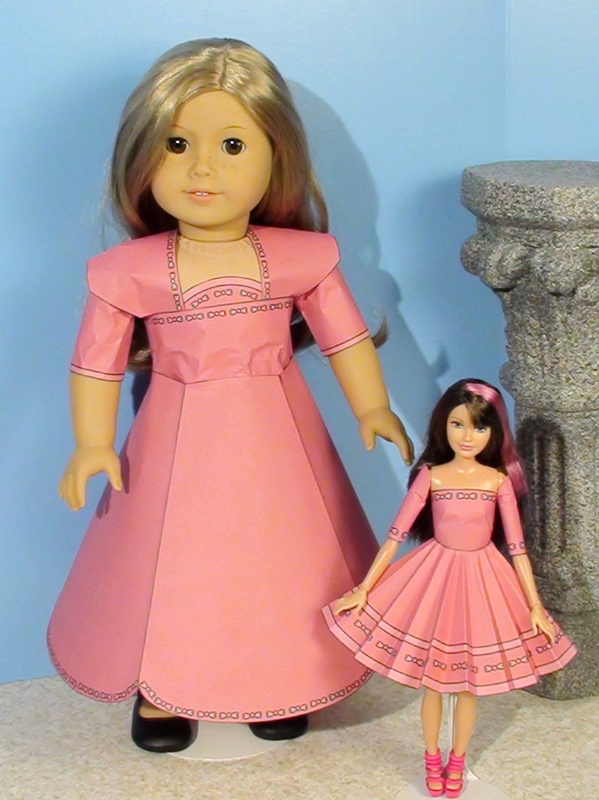 I’ll be making a tutorial video for making American Girl Doll clothes out of my designs soon. I will probably do some more experimenting and see what other combinations I come up with. 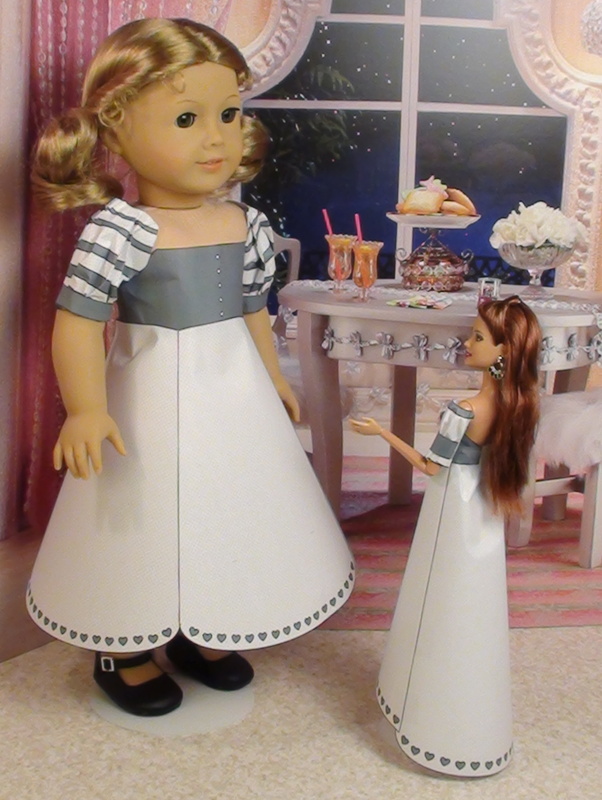 One of my 18″ American Girl dolls wanted a new dress… I had an idea that I could possibly put together a dress using pieces from my outfits so I thought I would give it a try. She picked out what dress she wanted and I came up with this. I used five backs of the flared skirt with train, two straight skirts, a small circle and four tops to make this dress. The top is made from two straight skirt pieces, two top pieces for the shoulder straps, and the tip of a small circle to add additional detail. I taped everything as shown with the tape on the plain side of the paper. Then I wrapped the top around the doll and taped the straight skirt pieces together, it was a really snug fit. 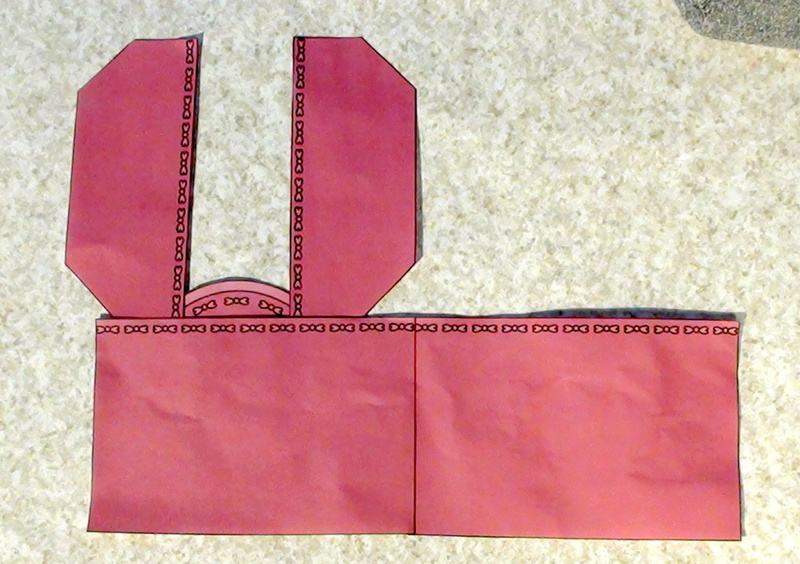 I folded the top pieces over and taped them to the back of the straight skirt. I used five pieces of the flared skirt with train, just the back piece with the train, and taped them together as shown in the picture. I wrapped the skirt around the doll’s waist, overlapped the edges in the back and taped it in place. Another variation of this dress would be to skip the sleeves and cut the shoulder top pieces into rectangles by cutting off the bottom half. This would be a more modern formal party dress look for the dress. I’ve since come up with another American Girl dress combination. You can see how to make this dress here.